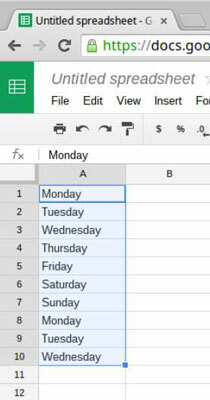 In cell A1, type the word Monday. In cell A2, type the word Tuesday. 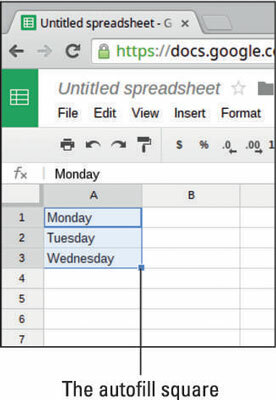 In cell A3, type the word Wednesday. Click on cell A1 and select these cells by dragging your cursor down to cell A3. Notice that a blue square appears in the bottom-right corner of your selection, as pictured in this figure. Click the blue Autofill square and drag your selection down to Cell A10. Sheets automatically fills your selection with the identified sequence, as shown here. You can use Autofill to complete most sequences as long as you give Autofill enough information to guess what your sequence is. If Autofill can’t identify your sequence, it simply replicates your data as a pattern.